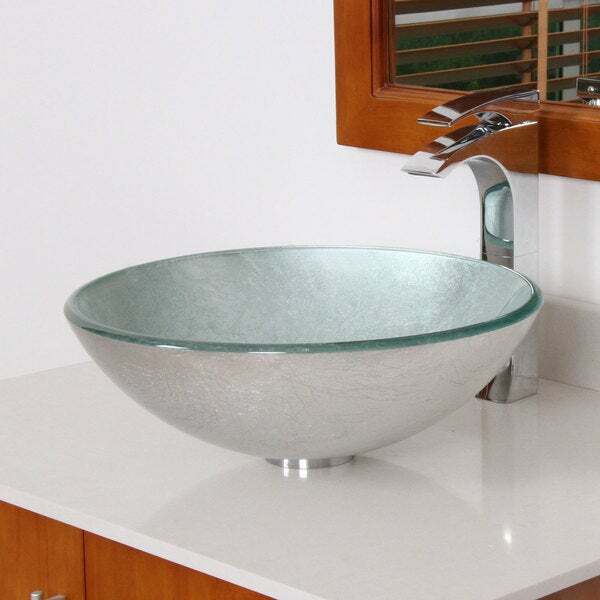 Beautify your bathroom with this Elle tempered-glass bathroom vessel sink. 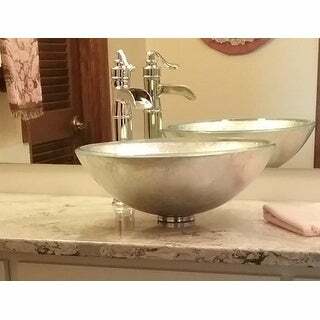 The pretty bowl design of this sink is dressed up with the look of smoothed-out crinkled aluminum core, creating sedate shine and interest. This sink comes with a modern pop-up stopper that eliminates pipe problems stemming from things being washed down the drain. This sink is stunning! It arrived packaged so snug that it felt like opening a present when UPS dropped it off. I cannot explain how beautiful this sink is and how happy I am with it on our newly remodeled bathroom. We paired this with a newly laid, soft grey concrete slab counter-top and brushed nickel waterfall vessel faucet. My wife loves this sink. Looks great. Even came with drain and installation supplies. I did not use those as the finishings were not nickel or stainless looking. Great style -- BIG vessel sink! Beautiful and stunning sink bowls. The silver is underneath so there is worry that it will peel off with repeated use. 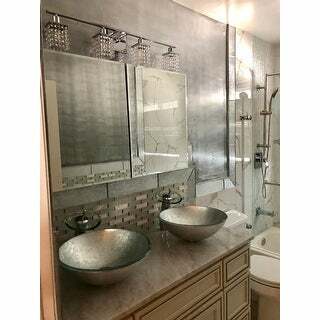 The silver sink completes my Shabby Chic look in the guest bathrooms. I put one in each bathroom because they are so beautiful. My first impression was WOW, This really nice. I love it!!!!!!! This sink is absolutely beautiful on my cherry vanity. It drains easily and water doesn't splash all over, as some vessel sinks suffer from. I purchased 2 of these after one of my previous bowls exploded on my son. These bowls are thicker and tempered glass so I feel safer having them in my kids' bathroom. We have really enjoyed this vessel sink because of the contrast of the silver to the light blue-green interior. Combining white tile with blue-green glass trim tile creates an overall soft impression in the guest bath. We use it as a stand alone vessel and it works as a beautiful and functional focal point. This vessel sink is simply beautiful. It turned out this one was too large for my small bathroom, but the return was made Very Easy. Love this sink! It is larger than I realized but it is perfect for the bathroom! While redoing my bathroom I found this sink... a great price and it's stunning! pictures do not do justice! Cant wait for these to be installed in our remodel master! Absolutely stunning and great value! I love the way it looks in my bathrooms, I added one to all 3 bathrooms. this vessel sink is elegant! ovestock offers it for such a great price! Love this one. I thought the finish might not hold up well but it has. No problem with clogs which happens sometimes with vessel sinks. This is a very stylish option. I really love the look of these sinks! They are sturdy and beautiful. They look amazing in our master bedroom. "Hi, I just ordered this beautiful sink! My question is, does the pop-up drain only come in chrome? I would prefer brushed nickel to match my faucet." I'm sorry we do not have the option to change the pop up drain. "Is the Kraus Mosaic Glass 14 inch Vessel sink clear or does it have a blue tint?" I would describe the inside of this sink as having a blue tint. "does this sink come with a mounting ring?" 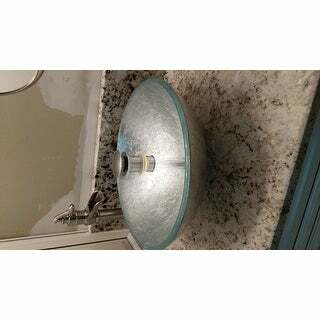 Hello Debra D W., this sink includes the pop-up drain and mounting ring. Thanks for shopping with us! "was there a hard plastic piece for sink friction washer to make sink tight my sink wobbles and leaks"
Hello linda, you will be contacted by Customer Care. Have a great day. "can you send installation instruction didn't come with my sink please"
It seems to be well made, I think it will match my tile and the price is right. "I just purchased this vessel. I love it, however there feels like rough spots on the bottom outside. A little concerned on the wear and cleaning. Has anyone had any problems? I don't want to return it"
Hello Audreyhepburn, we can appreciate the fact you want a firsthand account of the product. You will receive an email notification every time you get a response. Thank you for shopping with us.